“Certain Readers May Have a Nervous Reaction: The New York Times Election Needle Is Back, with a Few New Safety Feature — After the trauma of November 8, 2016, the Times is taking steps not to trigger its readers — even as it rolls out not one, but two, midterm-election needles” . The needle, which debuted with Trump vs. Clinton, is a symbol of the speed with which political hopes can be upended, as well as the maddening uncertainty of polling — and liberals are still deeply haunted by it. On November 8, 2016, the Times’s pre-election data initially showed Hillary Clinton with an 85 percent chance of victory. That prediction was based on the Times’s internal aggregation of all the credible polls heading into the homestretch of the race. In the days and hours leading up to the earliest returns, the 85 percent figure was featured heavily in Times news coverage and on the home page. 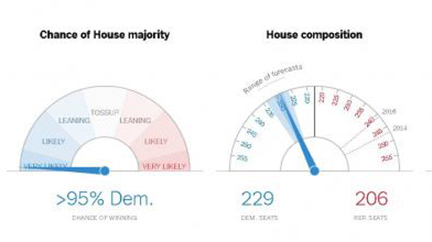 Additionally, it provided the starting point for the needle — also prominently displayed on nytimes.com — which began the night tilting reassuringly toward the blue end of the forecast dial.